Russians Svetlana Kuznetsova and Dinara Safina cruised into the final of the Pan Pacific Open with straight-set victories Saturday. Fifth-seeded Kuznetsova, who upset top-seeded Serbian Jelena Jankovic in the quarterfinal round beat Slovenia's Katarina Srebotnik 7-6 (5), 6-2, while Safina routed compatriot Nadia Petrova 6-1, 6-0 in the second semifinal. 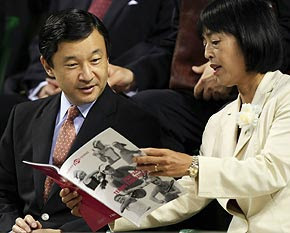 one to Naruhito, and he made an impressive catch. "I'm enjoying myself here," Kuznetsova said. "I'm trying to do new things and it's exciting to be on the court." After a closely contested first set, Kuznetsova took control in the second, breaking Srebotnik three times. Kuznetsova broke Srebotnik with a backhand down the line in the seventh game to go ahead 5-2. She raced to a 40-love lead in the next game but Srebotnik fought back to deuce before Kuznetsova won her fourth match point. Kuznetsova, who won the U.S. Open in 2004, will be bidding for her first title of 2008. Her last Tier I singles title was in 2006 in Miami. Last week she helped Russia to a win over Spain in the Fed Cup final Monday and said that win boosted her heading to Japan. 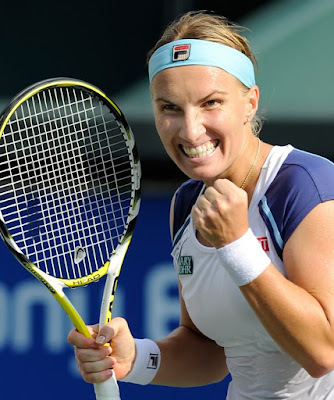 "Winning the Fed Cup has given me more motivation," Kuznetsova said. It was Safina's first win in six matches against Petrova. "There is a first time for everything in life and today was my first win over her," said Safina, who is fifth in the WTA rankings and had seven aces. "We've had some good matches in the past," added Safina. "I wasn't like I was thinking that I had never beaten her before, the strategy was to just go out there and hit the ball as hard as I can." Safina wasn't thinking too much about Sunday's final being an all-Russian affair. "It's just another match," Safina said. "We know each other well and I hope it's going to be a good match that we both can enjoy." The 2008 champion at this Tier I hardcourt tournament will collect $196,900.